The Purchase tab allows you to apply in-app purchases to features in your app. In this article we'll go over how to do this. What is the Purchase Tab? The Purchase tab allows you to apply a single in-app purchase or a subscription in-app purchase to features in your app. 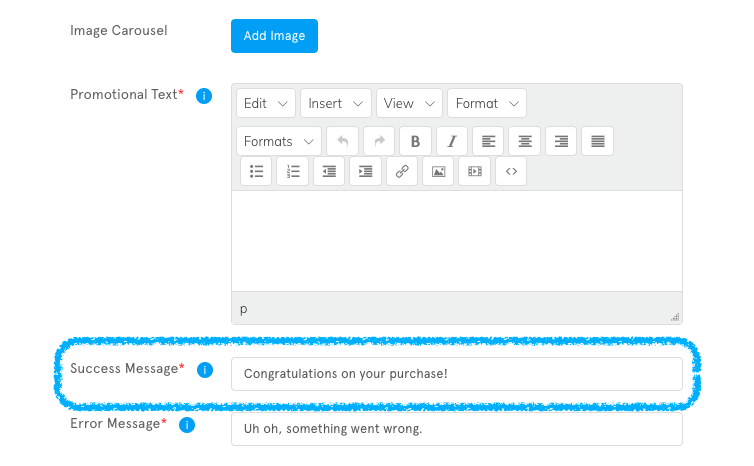 In this article we’ll go over how to apply an in-app purchase to a feature in your app. In-App Purchases (IAPs) are a great way to monetize your app. Rather than charging a flat fee to download your app, you can offer access to specific in-app sections. This allows you to offer some content to the general user, but also offer ‘premium’ content/features of your app for a price. 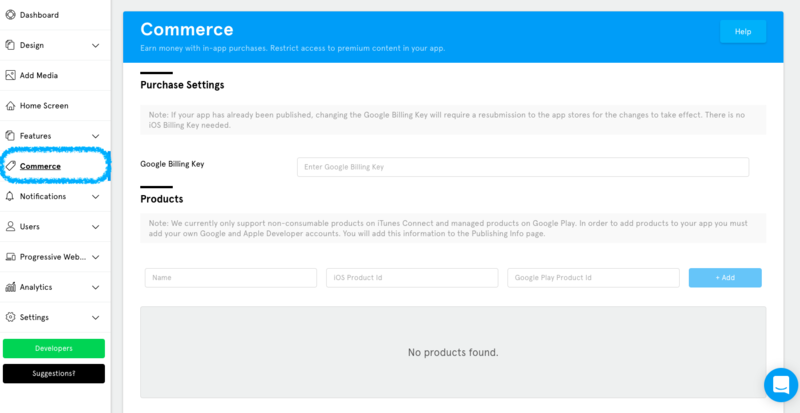 Important: Before you use the Purchase tab, you’ll need to make sure your Apple and Google developer accounts are set up for in-app purchases, and you’ll need to create in-app purchase listings in them. If you need help with setting up your Google account for in-app purchases you can learn how to do so here. We also have articles on how to set up Single In-App Purchases and Subscription In-App Purchases for Android. If you need help with setting up your App Store Connect account for in-app purchases you can learn how to do so here. We also have articles on how to set up Single In-App Purchases and Subscription In-App Purchases for iOS. What is the Purchase Tab’s primary function and what are the steps to accomplish it? Once you’ve clicked on the “Purchase” tab for the feature that you want to apply an in-app purchase to, check the box next to “Require Purchase”. Since you’re setting up a single in-app purchase, you’ll need to select “single” as the purchase type which will bring up the Purchase Settings for single in-app purchases. The Promotional Text is what your app’s user sees before they make the purchase. We recommend that you use this to tell people the benefits of content that they’d be purchasing. This helps give them an added reason to make the purchase. The Purchase Button Text is what will display on the button that the app’s user presses on to initiate the in-app purchase. The Product Name section is where you assign the in-app purchase that you’ve set up in the “Commerce” tab to the feature. The Success Message is what will display if the in-app purchase is successful for the app’s user. The Error Message is what will display if the in-app purchase doesn’t go through for the app’s user. The Other Actions section is optional and it allows you to add an additional action to the in-app purchase prompt through our Action Builder. If you would like to learn more about our Action Builder, you can do so here. Once you’ve filled out the Purchase Settings, all of that information will be automatically saved in our system. In order to apply this to your live app, click the “Publish” button at the top of the App Dashboard. Before you do so, double check that the in-app purchase has been correctly set up in your Apple and Google accounts, as well as in the “Commerce” tab of the App Dashboard. Now let’s go over how to apply a Subscription in-app purchase. Note: People on our Professional plan are able to apply one subscription type to a feature at a time while people on our Business plan are able to apply up to three different subscription types per feature. If you want to give your users different payment plan options (monthly, quarterly, annual) then we recommend upgrading to our Business plan. 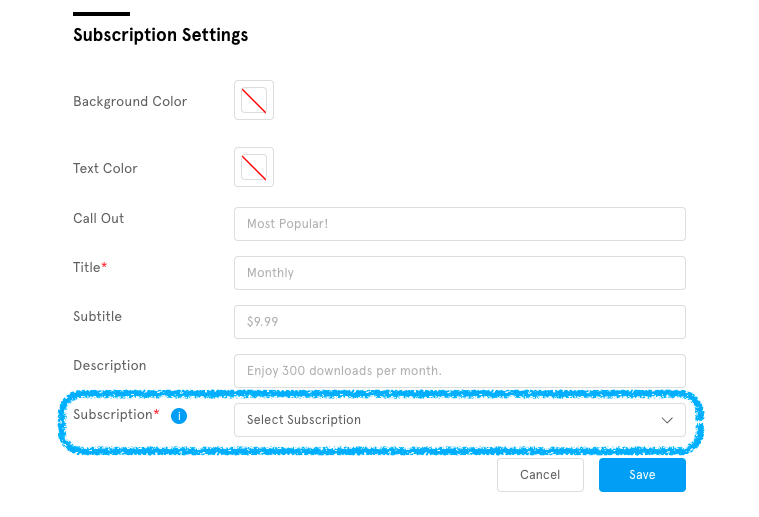 Since you’re setting up a subscription in-app purchase, you’ll need to select “Subscription” as the purchase type which will bring up the Purchase Settings for subscription in-app purchases. 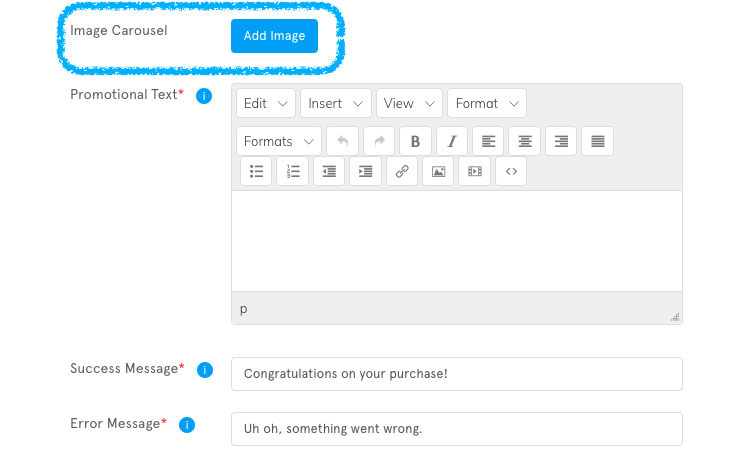 The image carousel allows you to add images above the text that you add to the “Promotional Text” box. This is a great place to showcase the premium content housed behind the subscription in-app purchase. This will appear above the subscription(s) that you set up for the feature. If you would like to learn more about everything that you can do in our Image Carousel, you can do so here. The Promotional Text is what your app’s user sees before they sign up for the subscription(s). 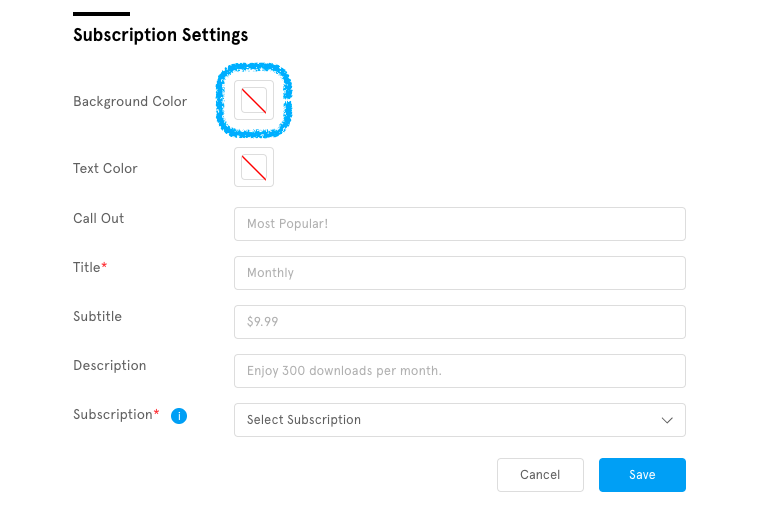 This displays above the subscription(s) that you set up for the feature. We recommend that you use this to tell people the benefits of content that they’d be subscribing to, or the difference between the different subscriptions if you have more than one. This will appear above the subscription(s) that you set up for the feature. The Success Message is what will display if the in-app purchase of the subscription is successful for the app’s user. The Error Message is what will display if the in-app purchase of the subscription doesn’t go through for the app’s user. Next you’ll need to set up the subscription(s) for that feature in your app. As we mentioned earlier in this article, how many subscriptions you can set up is dependent on your plan. People on our Professional plan are able to apply one subscription type to a feature at a time while people on our Business plan are able to apply up to three different subscription types per feature. If you want to give your users different payment plan options (monthly, quarterly, annual) then we recommend upgrading to our Business plan. 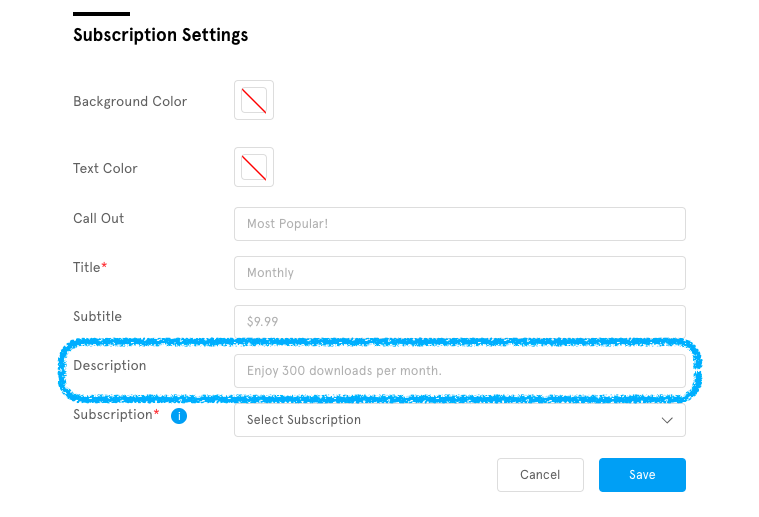 In order to set up a subscription click on “Add New”. Clicking this will take you to the Subscription Settings. 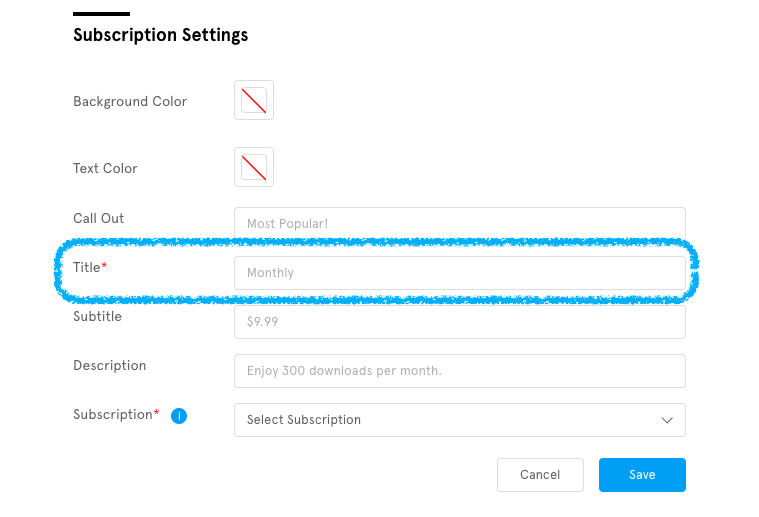 Here you can set up the look of the subscription plan, as well as assign the subscription in-app purchase that you set up in the Commerce tab of the App Dashboard. 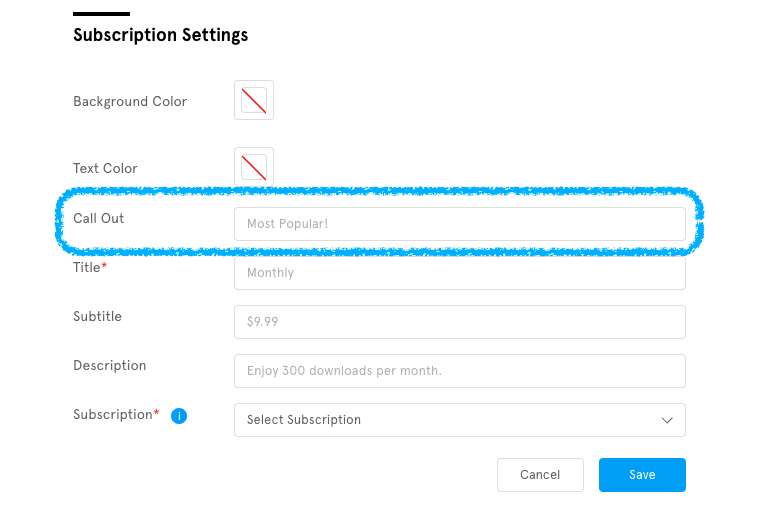 Let’s go over the different sections of the Subscription Settings. This will bring up a Color Settings box which allows you to make all kinds of adjustments to the background color. 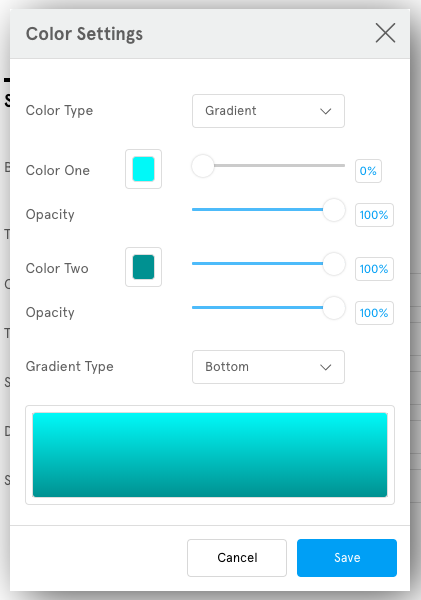 You can pick from using a gradient or a single solid color, the choice is up to you. 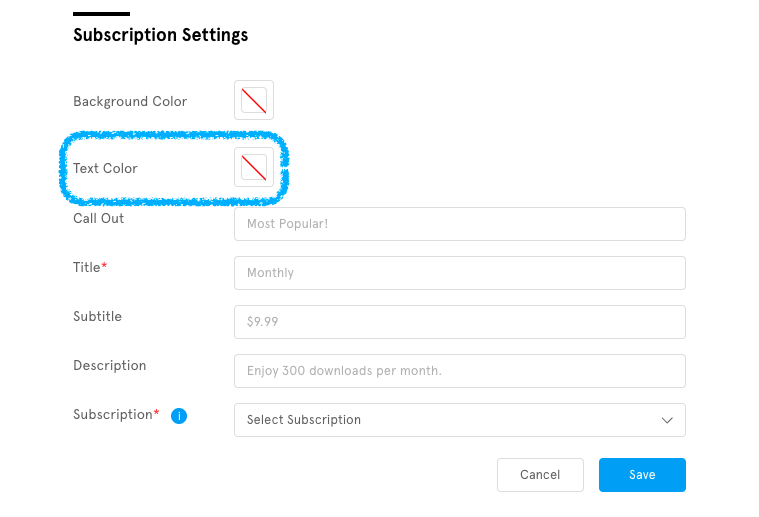 Similar to the Background Color option, the Text Color option allows you to change the text color used in the subscription’s card. 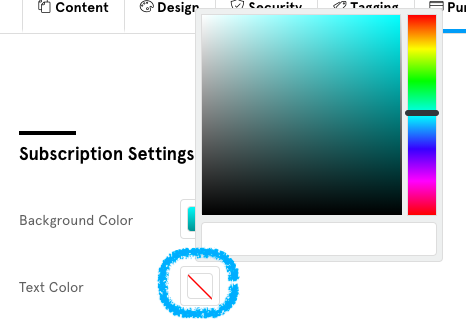 To change the color of the text in the card, simply click on the box next to “Text Color” and a color picker will appear which will allow you to pick a color or enter in a hex code. The Call Out box is optional, but it is a great way to add attention to a particular subscription if you have multiple ones and you want to single one out as the most popular one, or if you want to add some additional attention to your single subscription. The Title is required. You can give the subscription a name such as Silver, Gold, or Platinum, or you can simply type in the subscription’s price. The Subtitle is optional, but is a great way to display the subscription’s price if you’re using the Title for the subscription’s name. The Description is also optional, but is a great way to add any additional information for the subscription that you’d like to include. 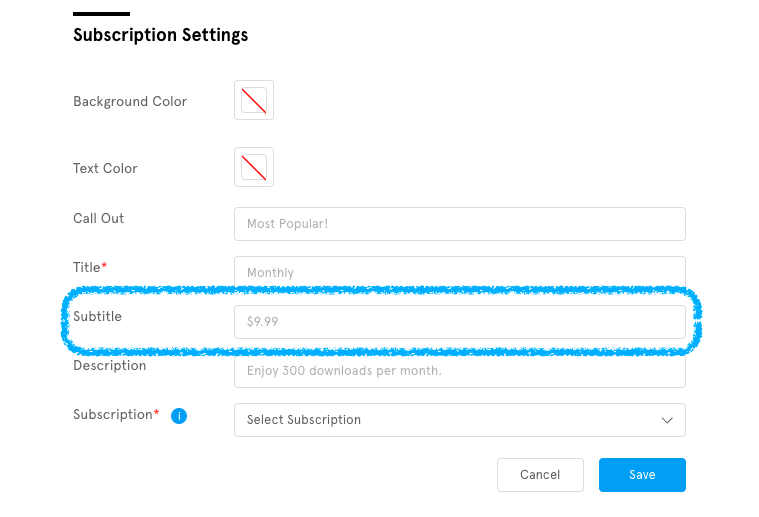 The Subscription section is where you assign the in-app subscription that you’ve set up in the “Commerce” tab to the feature. 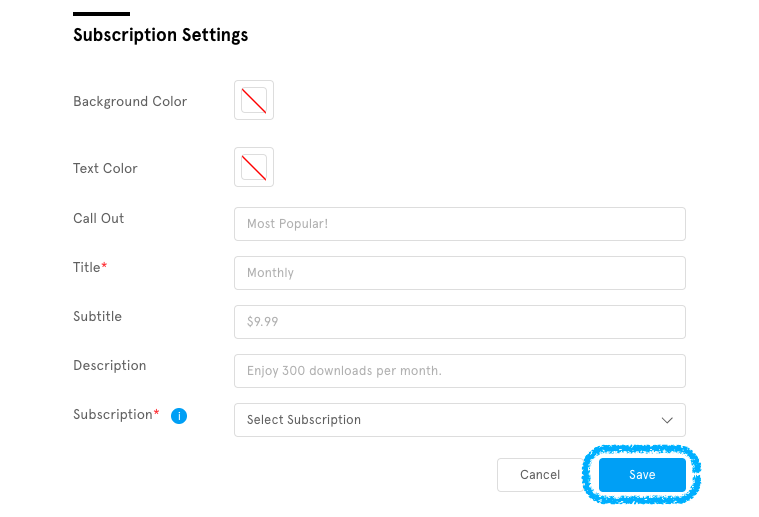 Once you have filled out the Subscription Settings to your liking, click “Save” to apply the subscription to that feature. Congratulations! You’ve set up your first in-app subscription! In order to apply this to your live app, click the “Publish” button at the top of the App Dashboard. Before you do so, double check that the in-app subscription has been correctly set up in your Apple and Google accounts, as well as in the “Commerce” tab of the App Dashboard. 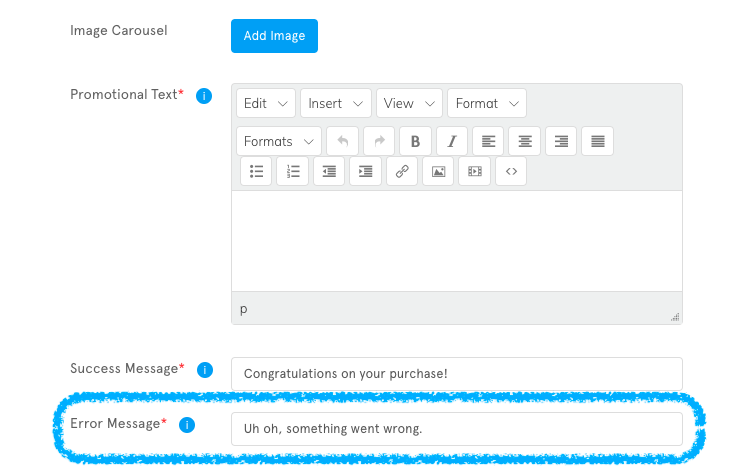 If you’re on our Business plan and you want to add multiple subscriptions to a feature once you’re done setting up your first subscription, simply click on “Add New” next to Subscriptions to add the next subscription to the feature.